The "Softener of Evil Hearts" Icon was present at the election of the new Russian Patriarch, and was seen by witnesses to be damp with myrrh. I suppose they knew it was myrrh because of the aroma. What is the significance of this? First of all, it is necessary to know something about the Icon. It is believed to have come from southwestern Rus', but there is no real evidence that this is true. This means that we cannot say how old the original Icon was. 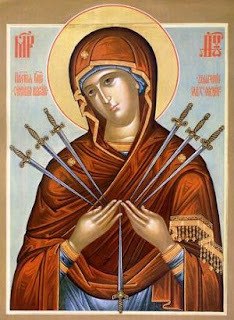 It is unusual in its depiction of the seven swords or "sorrows" of the Mother of God with one sword piercing the heart from below. It is connected with the story of the Presentation of Christ when Simeon predicted that a sword would pierce the soul of Mary. In Orthodox teaching - as in other Christian traditions -following the Hebrew understanding, the number seven means "fullness" or "abundance". In this case the seven swords symbolise the fullness of the sorrow, pain and heartache experienced by the Immaculate Mother of God in her earthly life. The Icon has been seen as "prophetic", pointing to a time when justice, peace and charity will be seen throughout the earth. Myrrh is not just a symbol of death (as in the gifts of the Magi). It is also a healing agent and is one of the ingredients of the oil of anointing connected with the Aaronic priesthood. In this Icon, and in the contect of the elction of a new Patriarch, the miraculous appearance of Myrrh cannot mean "future death", rather does it point towards healing and the anointing of a chosen servant of God. Many Russian Orthodox believers will no doubt see the miracle as a confirmation of the choice of Metropolitan Kirill, and will be hoping indeed that a time of peace and charity will come not only to Russia but to the world beyond. Icons have been particularly important in the history of Russia and the Russian Church. There are another two Icons which are particulalry interesting in relation to the sufferings of the Russian people since the Revolution. The first is the Icon of Our Lady of Kazan, of which there were two significant copies. The original Icon was carried into battle by Peter the Great. One of the versions of the Icon was housed in the Cathedral of Our Lady in St. Petersburg. Under the communists this was turned into a museum. There is also a church dedicated to Our Lady of Kazan in Moscow and another connected to the csar's palace. One of the versions of the Icon was bought at great expense from a private collector and found its way into the hands of the Blue Army (an association connected with the Message of Our Lady of Fatima). This was given to the Pope who said that he would return it to the Russian Church when he was sure it would be safe. Pope John Paul 11returned it to the Moscow Patriarchate in 2004. A picture of this Icon will be in my next posting.